thekua recipe | khajur recipe | bihari khasta thekua recipe with detailed photo and video recipe. a traditional and unique deep fried sweet recipe made with wheat flour and sugar. it belongs to bihari cuisine and in bihar it is served as an evening snack similar to biscuits or cookies. it is also used as prasad and served to gods especially during the chhath puja and served in the feast. thekua recipe | khajur recipe | bihari khasta thekua recipe with step by step photo and video recipe. each state of india has its own unique traditional recipes which have been carried by generations. some recipes are either savoury, dessert recipes or it could be a morning breakfast. 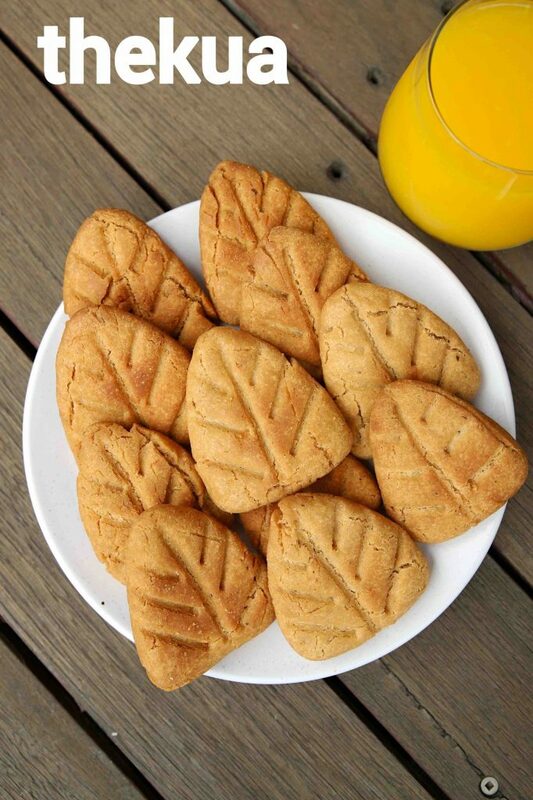 one such easy and simple sweet snack recipe is known as thekua recipe or khajur recipe made with wheat flour. 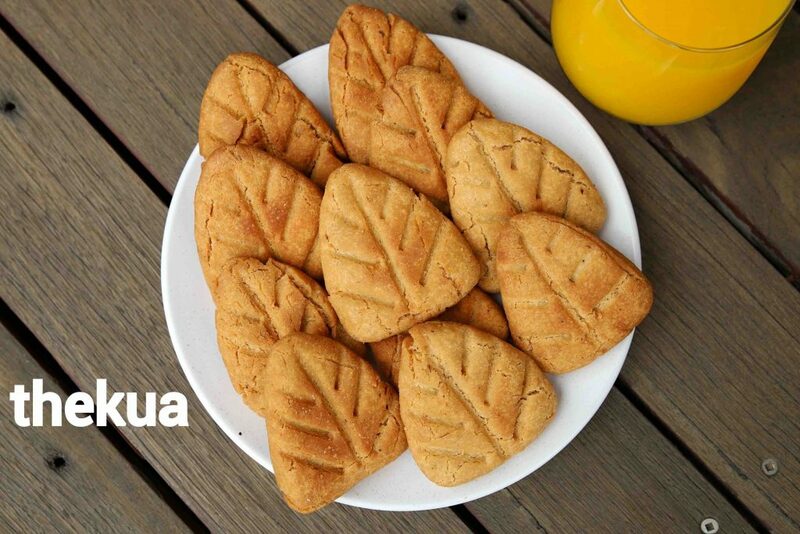 the recipe for thekua or khajur snack is pretty simple and is made with just 3 ingredients. basically, the dough is made with wheat flour mixed with melted sugar or sugar syrup with a generous amount of ghee. 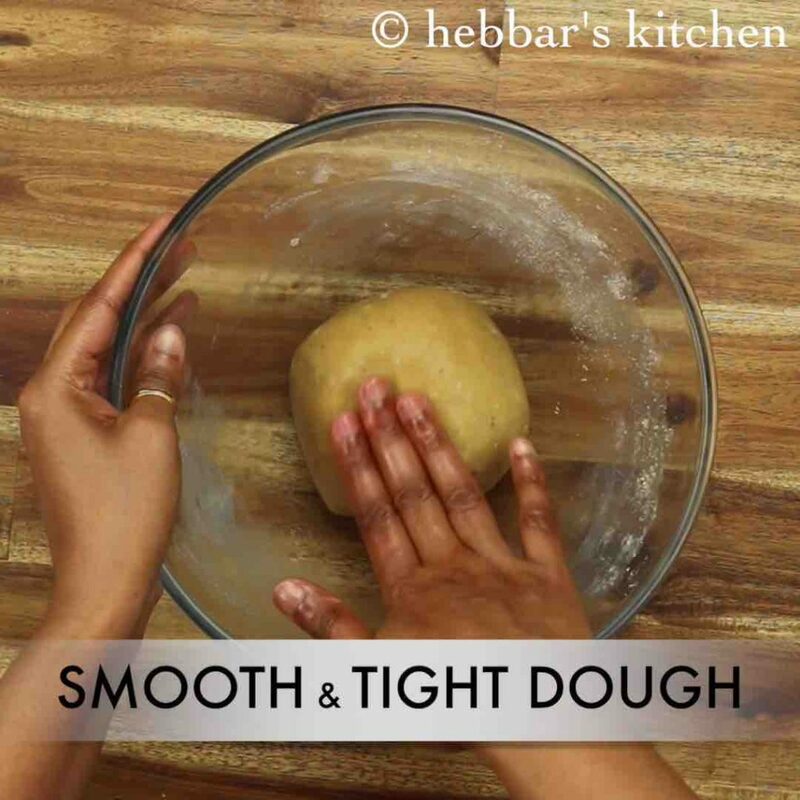 the dough has to be tight and later it is shaped to the desired shape with the required design on top of it. it is followed by deep frying it in ghee or even cooking oil until it attains crisp or reddish golden brown in colour. deep frying these snack makes it unique compared to other cookies or biscuits which is generally baked in ovens. also, thekua becomes more hard and crisp once it cools down which can be stored for 5-7 days in airtight container. 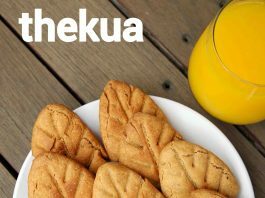 the recipe for thekua or khajur snack is simple with just 4 ingredients, yet some tips and suggestions to it. firstly, while preparing the dough the recipe can be extended by adding dry nuts like pista, almonds and cashews. adding nuts makes it more crunchy and nutty and thus improves the consuming experience. secondly, the traditional recipe is made with jaggery syrup which makes it healthy and tasty. 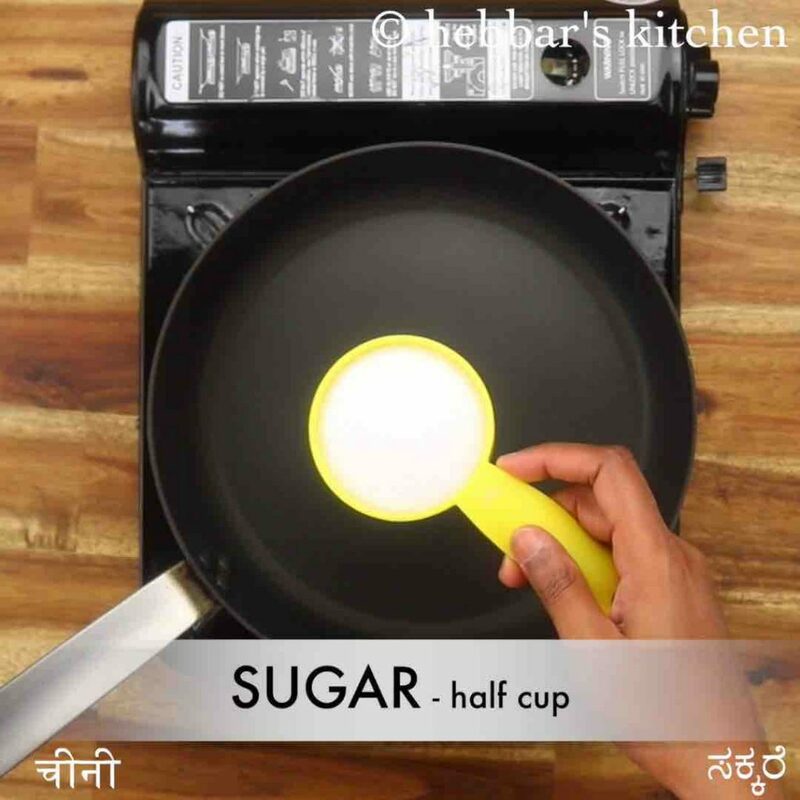 but in this recipe, i have used sugar syrup as i was running low with jaggery. lastly, you can take any desired shaper to shape these just before deep frying. i have used bare hands and eventually fork to design it but it is completely up to your preference. 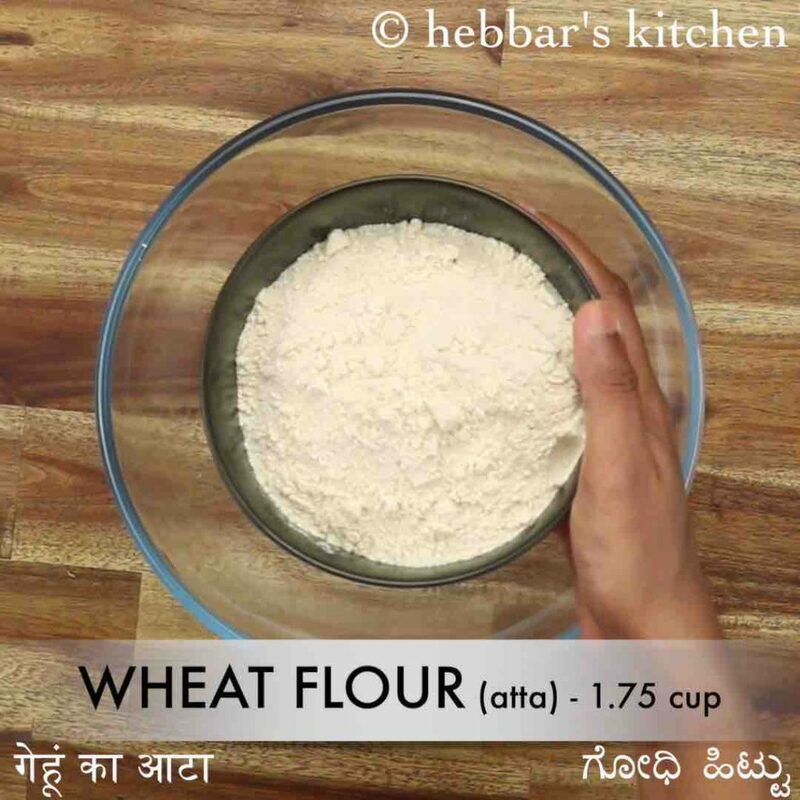 firstly, in a large mixing bowl take 1¾ cup wheat flour and 2 tbsp rava. 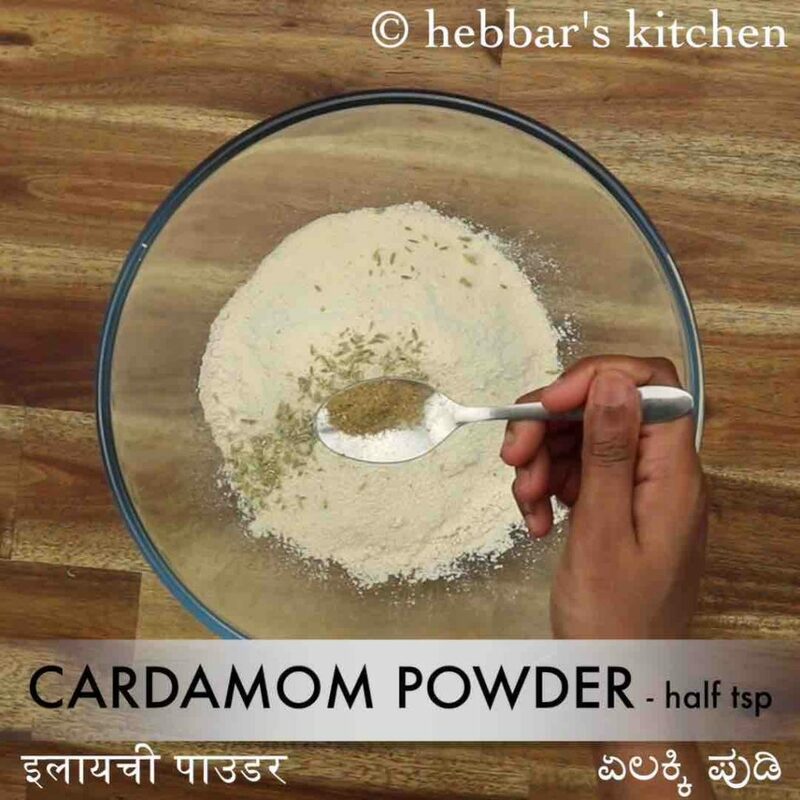 also add 1 tsp fennel, ½ tsp cardamom powder, 3 tbsp dry coconut and mix well. 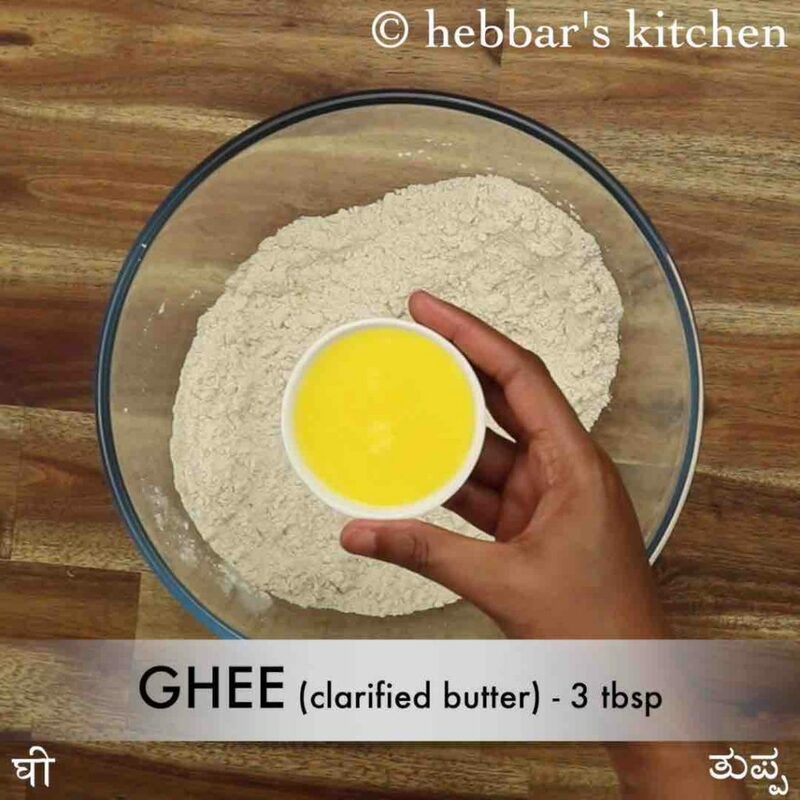 further, add 3 tbsp ghee. crumble and mix well making sure the dough holds shape. 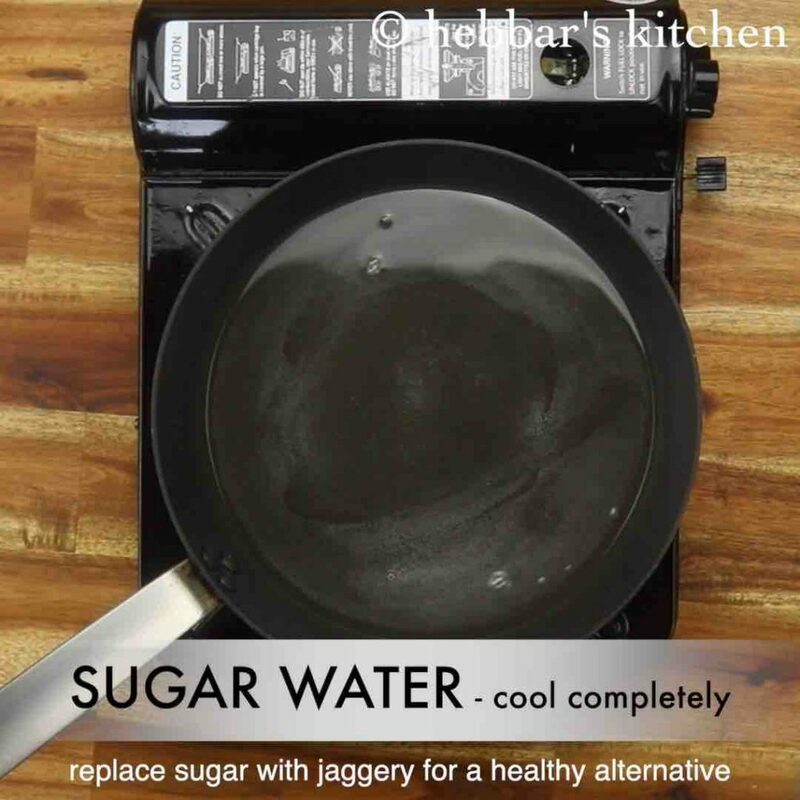 now prepare sugar water by heating ½ cup sugar in ½ cup water. stir well until the sugar dissolves completely. do not boil to attain any sugar syrup consistency. cool the usgar water completely, and pour over flour as required. knead to smooth and tight dough adding sugar water as required. pinch a small ball sized dough and roll to cylindrical shape. 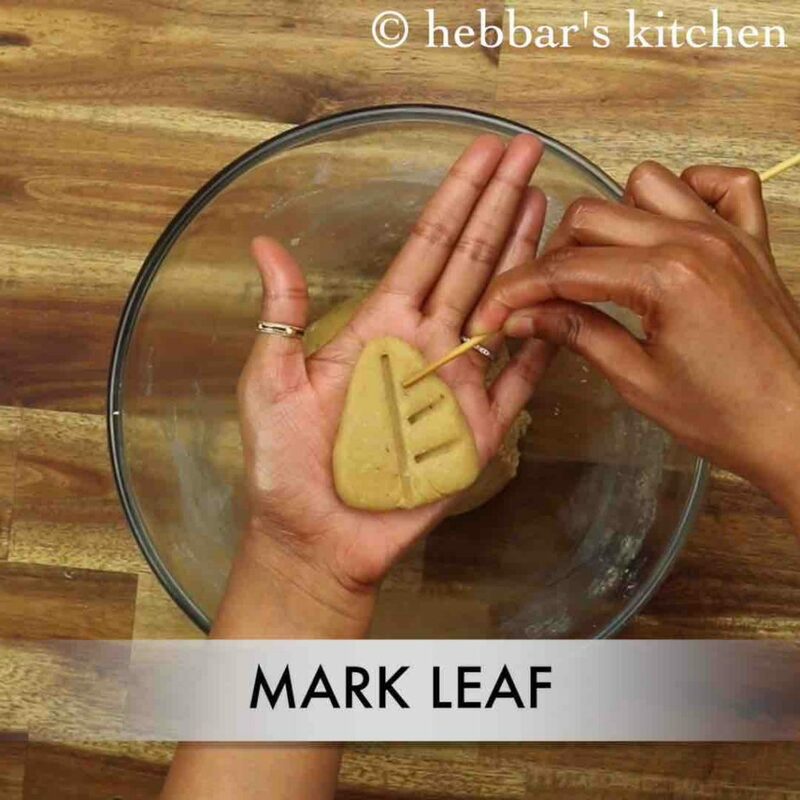 now shape to a triangle and mark leaves using a toothpick or skewer. deep fry in hot oil by dropping gently. or preheat and bake at 180 degree celsius for 12 minutes. 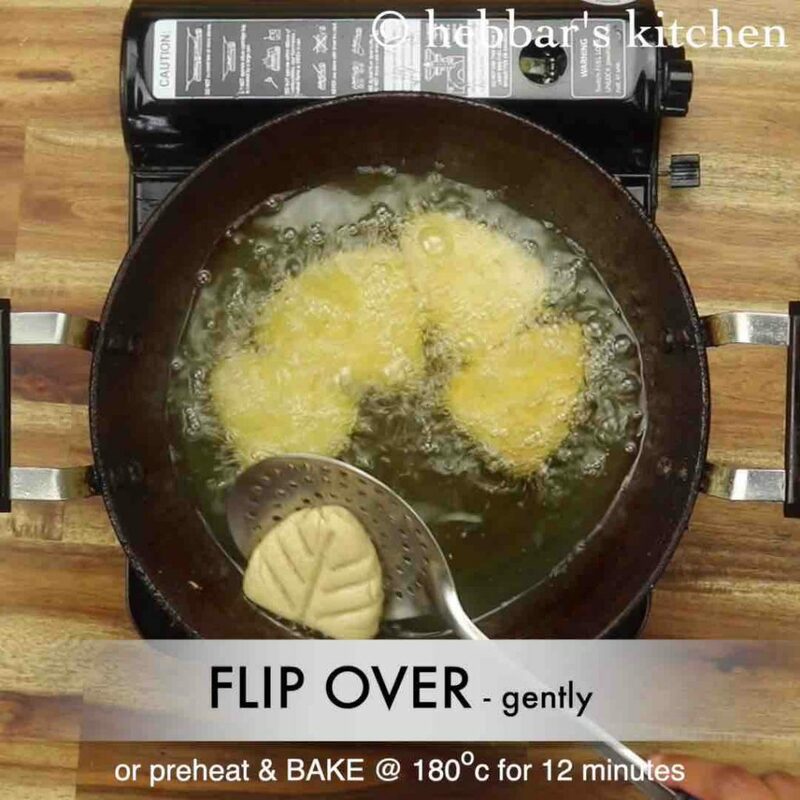 flip over gently as they will be very soft. 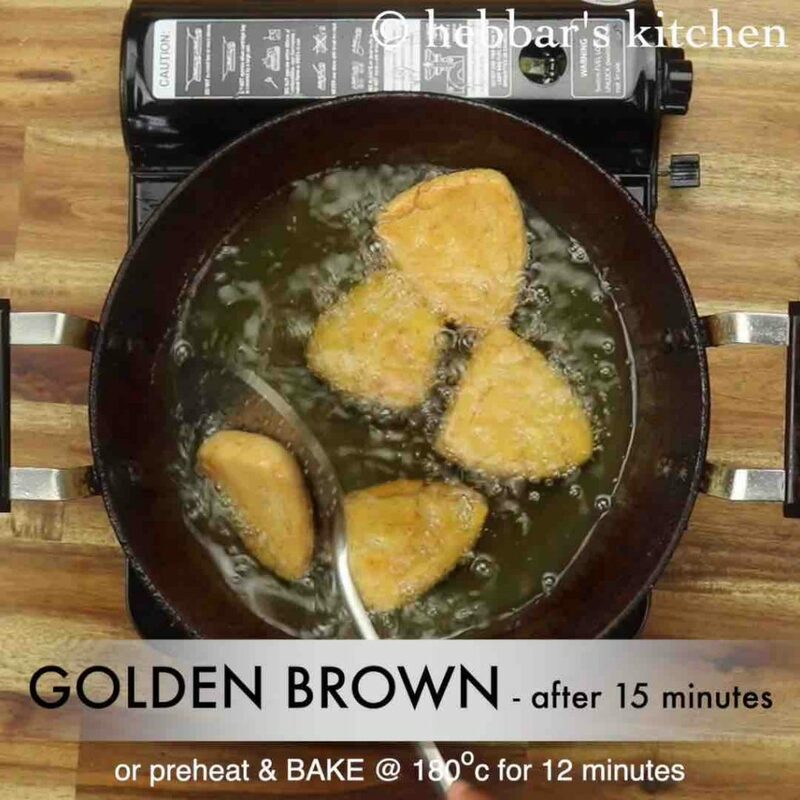 fry for 15 minutes or until both sides turns golden brown. 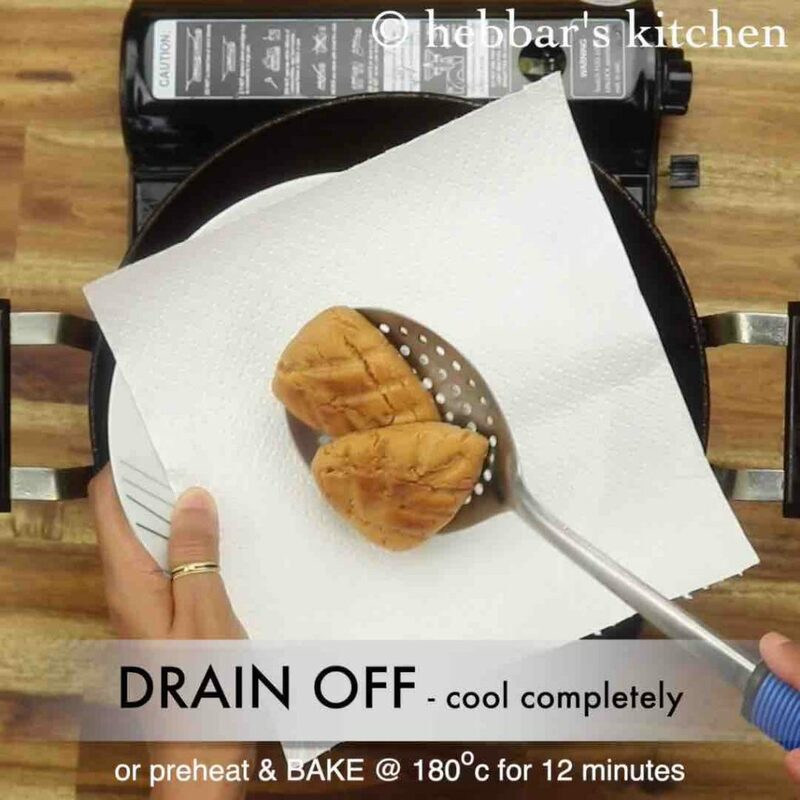 drain off and cool completely. thekua will be soft when hot, it turns crisp once cooled completely. finally, enjoy thekua with a hot cup of tea. cool the sugar water completely, and pour over flour as required. 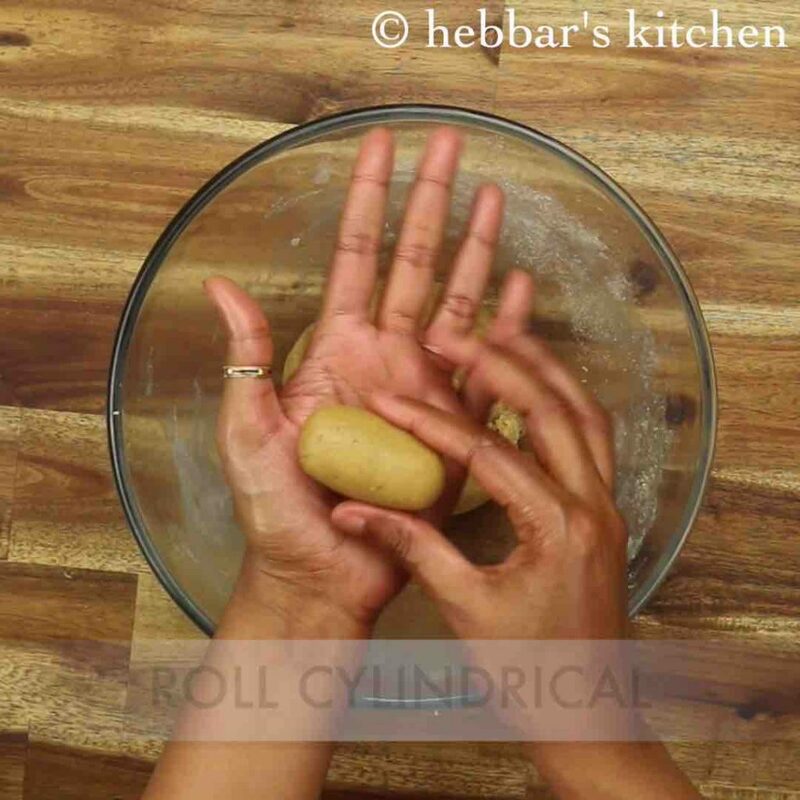 pinch a small ball sized dough and roll to cylindrical shape. you can alternatively use thekua mould to shape them. firstly, prepare with half maida and half wheat flour for more flaky texture. 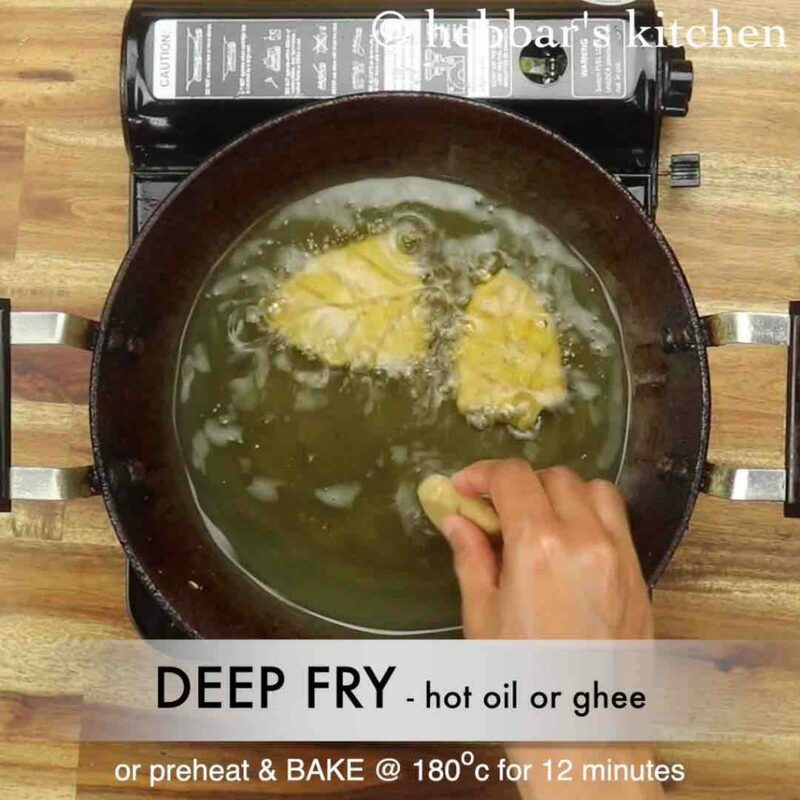 also, fry the thekua in ghee for more rich flavour. additionally, deep fry in low flame, else it will not turn crisp. 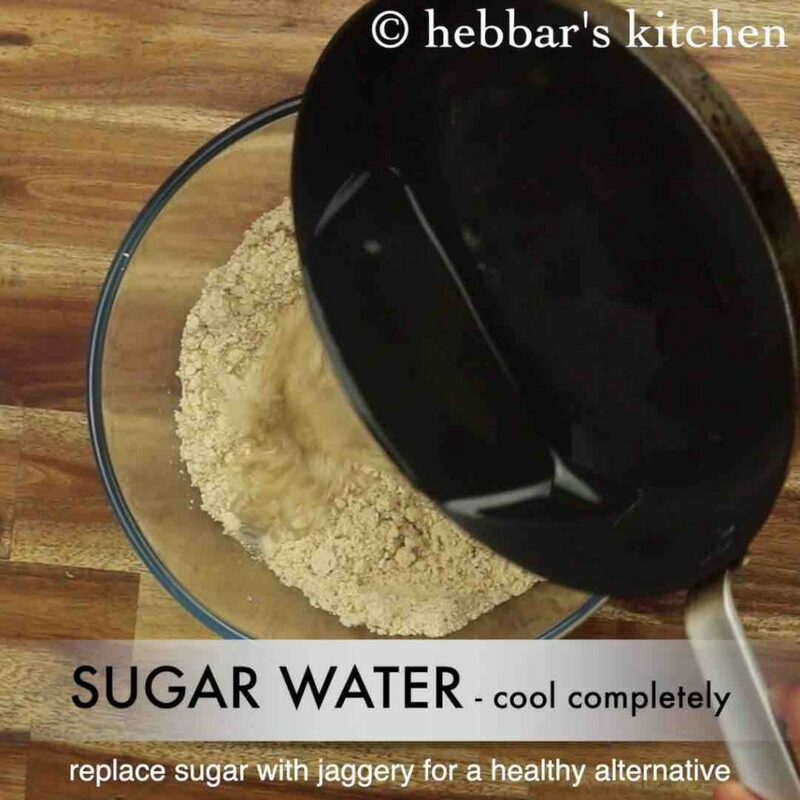 furthermore, replace sugar with jaggery as a healthy alternative. finally, thekua recipe will stay good for a week when stored in an airtight container.